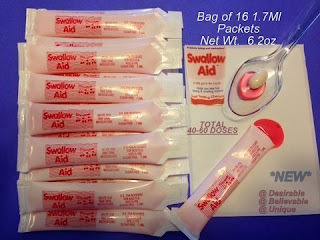 What do you think of this Swallow Aid? Over 4 out of 10 people have problems swallowing oral medications. Now there is help with this problem! Easy to use. Special formula in a CherryGel format designed to solve the severe problem of taking/swallowing medications that are bad tasting and smelling and hard to swallow without gagging/choking. Masks most unpleasant taste and smells from oral medications while minimizing any unpleasant mouth feel generated by large pills or capsules that can cause gagging/choking. Helps you take pills, capsules and liquid medications that are hard to swallow. Helps adults and kids 3+ years.